4How is a Wine Cellar Cork Flooring Maintained? 5What if the Cork Floor Starts to Show Signs of Wear? Wine cellars are meant to keep wines in the ideal conditions. Besides being functional and effective, wine cellar should also be well-designed and beautiful. One of the ways you can accentuate your wine storage room is by choosing carefully the type of material for your flooring. Cork is one of the most popular choices of materials used for wine cellar room floors. 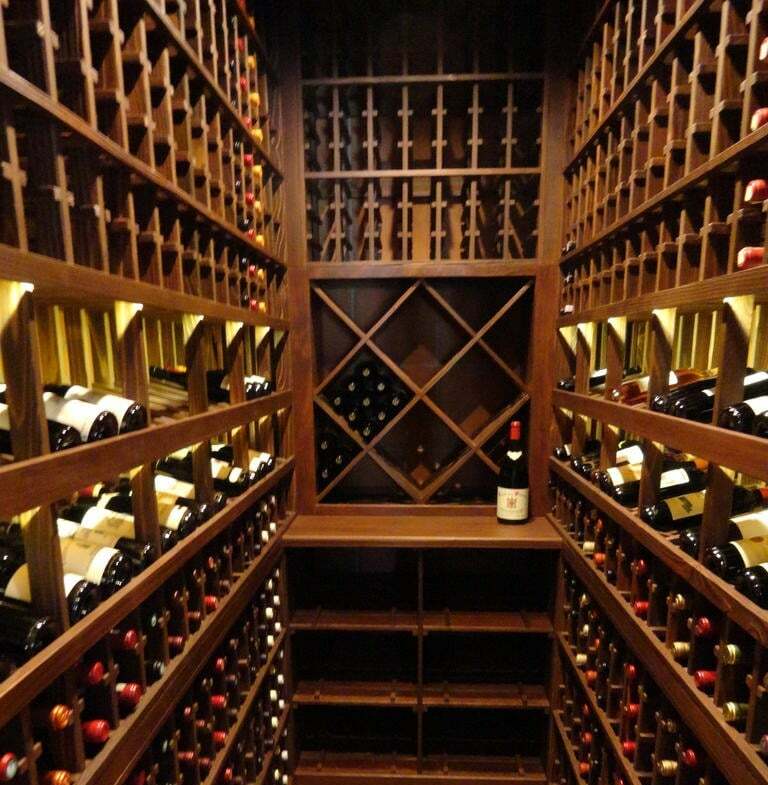 Want to have a beautiful wine cellar? Consider carefully what material you are going to use for the flooring! Cork is one of the best choices of materials for residential custom wine cellar flooring. Natural cork planks are an efficient and effective type of wine cellar flooring for many reasons. Cork is harvested from the Quercus Suber, also known as the cork oak tree. The tree grows exclusively around the Mediterranean Basin, and in the coastal regions of Algeria, France, Italy, Morocco, Portugal, Spain, Tunisia, and the islands of Corsica, Sardinia, and Sicily. This specie is a relatively slow growing type, but can live up to 200 years or more. With other trees, the most useful and most sought after part is the lumber of the trunk, but with cork oak trees, the most valuable part is the bark of the tree, which is harvested as cork. The bark of the cork oak tree is unusually thick, and is made up of tiny prism-shaped air pockets, which are responsible for the resilient and cushion-like surface of the bark. Cork has many uses, including wine bottle stoppers, material for insulation, floats, shoe insoles, washers, fishing rod grips, notice boards, and, of course, custom wine cellar flooring. Cork is resilient, which means that it can take the potential damages that may occur inside a wine cellar. It is also durable, and strong enough to take the weight of the many wine bottles in the storage room. The spongy, cushion-like surface makes cork comfortable to walk on, too. The bark from which cork is made has a natural fire inhibitor, which provides protection from wildfires that are common in the region where the cork oak trees grows. This insulation makes natural cork planks efficient in keeping the humidity and temperature inside the residential wine cellar at the ideal levels. Moreover, cork naturally contains Suberin, which is a waxy substance that acts as an insect repellant. This quality makes cork wine cellar flooring more durable and long lasting. The density of cork is determined by the size of its granules used. High density cork planks are those that have fewer voids that need to be filled by binding agents. Cork flooring is generally made up of layers of cork planks, and the topmost layer is usually a high density cork plank, to ensure durability of the cellar floor. Low density cork planks are only used for the bottom layers of the cork flooring. Although cork flooring can be bought without a finish, a finish must be applied upon installation. The most popular choice for a cork finish is polyurethane, although some people prefer to use paste wax. Some cork flooring suppliers provide cork that has a vinyl coating. Although this kind of cork is low maintenance, it is not easily repairable when damaged, nor can it be refinished. The thicker a cork layer is, the better it is as heat and sound insulation. The parquet tiles should be at least 4 mm thick, while bottom cork layers should be 2 to 3 mm thick, and the top cork layers should be at least 3 mm thick. How is a Wine Cellar Cork Flooring Maintained? Your residential custom wine cellar’s natural cork flooring is sure to last if you purchase a top quality material, and make sure to provide regular maintenance. Cork reacts highly to heat and humidity, and its organic pigments easily fade when exposed to light, especially direct sunlight. In order to preserve its quality, it is imperative that you protect your cork floor from excessive light, by using drapes or by being cautious with the type of lighting systems that you use for your custom wine cellar. Cork naturally turns yellowish as it ages, and uneven exposure to light can cause uneven aging. In order to keep your cork flooring evenly colored, you should rotate the cellar furnishings periodically. Cork flooring, like all types of wooden cellar floorings, expands and contracts frequently if the humidity and temperature inside the home wine cellar fluctuate constantly. In the long run, this can damage the flooring material. In order to protect your cork flooring, you need to make sure that the temperature in your wine storage room is efficiently controlled. Have a quality wine cellar cooling system keep the cellar temperature at around 55 to 60 degrees Fahrenheit, and the humidity at approximately 50%. It is common for abrasive particles to build up on any wine cellar floor. These particles can scratch your cork flooring’s finish, and, ultimately, damage it. In order to protect your cork floor from this, sweep or vacuum the cellar floor regularly. If you do use liquid cleaners on your cork floors, make sure that they are only sprayed or misted on the surface. Never get the floor wet, because this can damage the cork. This is why you should always make sure that wine spills on the cork floor are wiped up immediately. Damp mopping is alright. What if the Cork Floor Starts to Show Signs of Wear? If custom wine cellar cork flooring is not properly maintained, it can wear easily. If not dealt with immediately, the damage may be irreparable. If your wine cellar cork flooring is beginning to show signs of wear, you should have it refinished. After gently abrading and thoroughly cleaning the cork floor, two new coats of polyurethane can make the flooring look brand new again. Generally, a polyurethane finish lasts up to 10 years. Wine cellar floors that have been finished with wax need to be stripped and have a new coat of wax applied to them. Not all waxes are compatible with cork flooring, so it is important to check the label before purchasing any floor wax. Generally, residential custom wine cellar floors in Los Angeles, California that have been previously finished with wax should not be refinished using polyurethane, because wax penetrates deeply into the cork, thus preventing the polyurethane from adhering effectively.